“Bad Weather” begins like a detective story – with the robbery of an armored car – but the novel is actually about time and a country’s fate. The plot follows a union for veterans of the Afghan War in an industrial city and interweaves various threads. It takes place simultaneously during the Afghan War, the beginning of the 1990s, when the former soldiers opened their own businesses, as well as in the 2000s. Kommersant: To what extent is “Bad Weather” based on factual events? 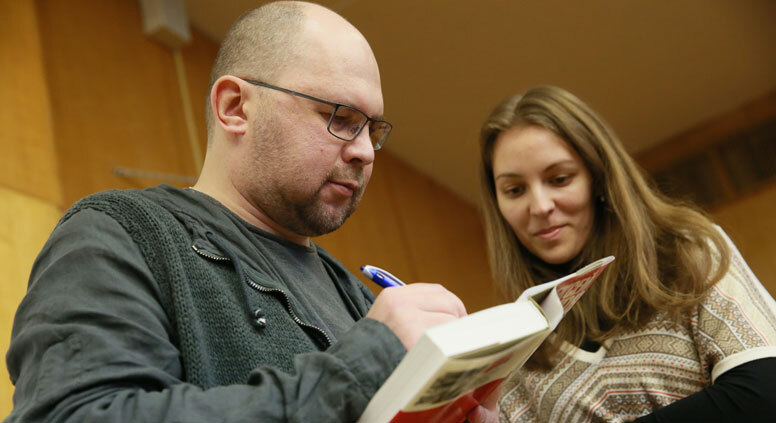 Alexei Ivanov: I would not describe it as a documentary work, but many real events related to the Afghan Veteran’s Union in Yekaterinburg are integrated into the novel. It is an existential work. After World War II a capo from Auschwitz and guards from Kolyma could prove better than Kant that God does not exist. But the experiences that were earlier compensated for with faith became known as existentia. Existentialism is the aggregate of experiences that someone feels when they not have faith. The protagonist of “Bad Weather,” Sergei, says that we refused to build communism, but do not believe in God. What do we have left? My characters are left with the myth of the Afghan brotherhood. Kommersant: And the idea of brotherhood, particularly military brotherhood, is perhaps the most important idea for Russia. A. I.: Brotherhood is really not that important in the novel. It is not about Afghan syndrome or the contemporary lives of Afghans, who were abandoned by society and the government. It is about how people look for a way to believe each other in a world dominated by predators. They realize that they cannot believe anyone. But they know that they cannot live without trust, which is why they need to find ways to believe each other. The Afghan brotherhood is one such way. Kommersant: Do you think a common Russian idea, a central national identity, exists? Alexei Ivanov was born in 1969. He spent his childhood and youth in Perm, and currently lives in Yekaterinburg. He began writing at the start of the 1990s, but only found fame 13 years later with the publication of “The Heart of Parma.” Following the novel “The Gold of the Rebellion,” the critic Lev Danilkin called Ivanov “Russian literature’s gold reserves.” The film “The Geographer Drank His Globe Away,” which was based on his novel, won many prizes and was commercially successful. Recently Ivanov has been writing a lot of regional non-fiction. Kommersant: But do we really have a common value system? A. I.: We share common values, but their hierarchical arrangement differs somewhat depending on a person’s identity. And at the top of the hierarchy there is always a kind of meta-value through which people with this identity self-actualize. For the Urals the main value is work; for the White Sea region and Siberia the main value is enterprise. For central Russia it is power and property. For southern, Cossack Russia it is social justice. Kommersant: Don’t you feel that this is rather speculative? For example, I live in Moscow, but neither money nor power has any meaning for me – yet I continue living in Moscow. A. I.: Any scheme is speculative: that is why it is a scheme. You do not necessarily have to share a region’s identity. You evidently belong to a different cultural background; not the Russian peasant one, which places most importance on power and property: Moscow is its embodiment. You can live in Moscow or in a village near Chelyabinsk and belong to the culture of globalization. Kommersant: But in that case, where are the regional values, and how do they influence people? A. I.: They can manifest themselves in various ways. For example, until recently the southern Russian regions were considered the “red belt.” The land there is fertile; people are wealthier than in the north or Siberia and should therefore have bourgeois, capitalist values. However, they elected a communist governor. They did so because the most important value for the people of the Cossack south is social justice, a value that was proclaimed by the USSR. It is useless to place bets on modern ideas such as innovation in that region because locals will not engage with them. Important social projects, however, will be very popular. Kommersant: Why do you think the modernization project has failed in Russia? A. I.: It is being held back by the bureaucracy, which doesn't really need it. There is no demand for modernization among the elite and the governing class. I think that it would be supported by the determined part of society: the youth, people between 30 and 40, who really want to do something.